The Spa at Four Seasons Hotel Atlanta reflects the ultimate in luxury and contemplation. It features a contemporary, tranquil setting that allows clients’ stress to melt away, and its urban sanctuary promises to replenish the total being. The Peaches and Cream Manicure & Pedicure begins with a creamy, fruit-infused soak, followed by a frothy layer of a hydrating mask. After a massage with oil infused with jasmine and fuji apple, the hands and feet are treated to a layer of warm whipped topping to hydrate and nourish—and it’s is all fat-free. Step 1: Fill soaking bowl with warm water. Disinfect all implements and surfaces. Step 2: Welcome the client and perform a consultation to determine whether the client has any health or lifestyle concerns. Diabetic clients should check with a physician before receiving a pedicure. Suggest a strengthener or base coat and a top coat. Step 3: Add one scoop of peach mineral bath salts to the water and gently place the client’s hands or feet into the water, depending on the treatment being performed. Allow them to soak for five minutes. Step 4: Remove one hand/foot from the water. If performing the pedicure, spray the client’s foot with cleanser. Step 5: Perform a visual check and nail analysis, then file and shape free edges. Step 6: Hydrate cuticles. Apply a layer of massage oil and perform a hand/foot massage for five minutes. Step 7: After the massage, apply the mask, which energizes the solar plexus chakra, smoothes rough areas and sloughes off dead skin cells. Step 8: Apply sugar and peach scrub over the oil and gently rub in a circular motion. Step 9: Place hand/foot back in the water and repeat on the other hand/foot. Step 10: Remove hands/feet from water and pat dry clean cuticles. Step 11: If performing the pedicure, file calloused skin with a foot file and apply callus remover, if desired, to heels and balls of feet depending on the amount of exfoliation needed. Immerse feet back into water and then bring them out to clean beneath free edges with an orangewood stick. Pat dry. 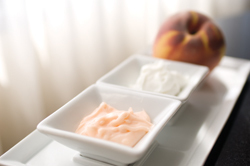 Step 12: Apply peach hydrating cream on hands and arms or feet and legs, and massage for three minutes. Step 13: Making sure all residue is removed, polish nail beds, if desired by the client, or buff them. Step 14: Apply base coat or strengthener, two coats of color, and finish with a top coat.